Looking for that last minute treat to take to a Halloween Party? 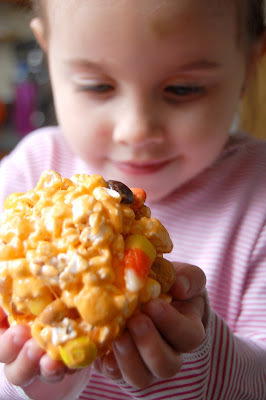 Here's a quick lil' treat you can do with your kiddos. 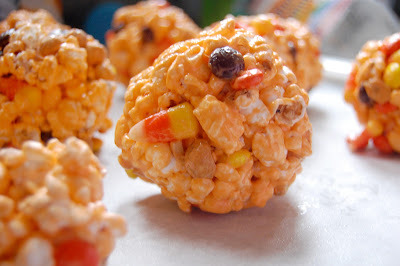 I'm not sure what to call it, but it's kinda a popcorn ball/rice krispy treat without the rice krispies. Ha ha. Throw in some candy and here you go! Okay, I knew these were going to be sweet so I wanted to try and balance it out with salted popcorn and salted peanuts. So I used one bag of microwave popcorn (approx. 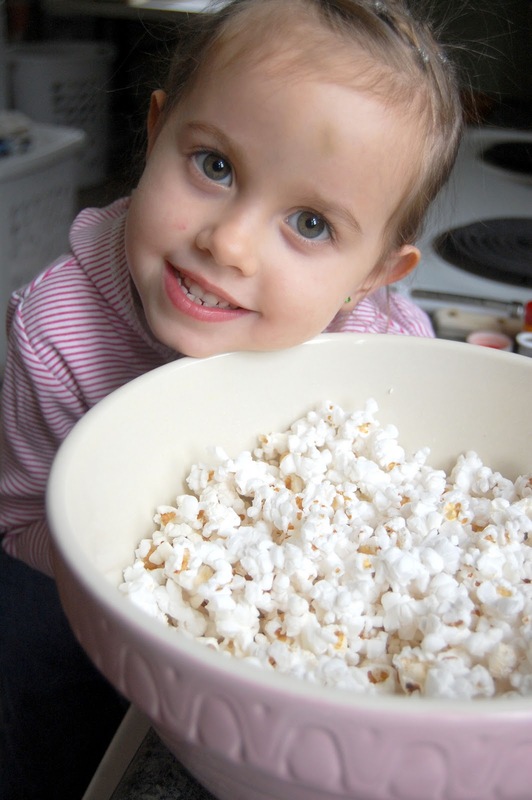 5 cups) and I air popped about 3 cups of plain popcorn. Next time I would use another bag of microwave and just save the extra. Sift through your popcorn and take out the unpopped kernels. You don't want to unexpectedly bite into one of those babies. Ouch! 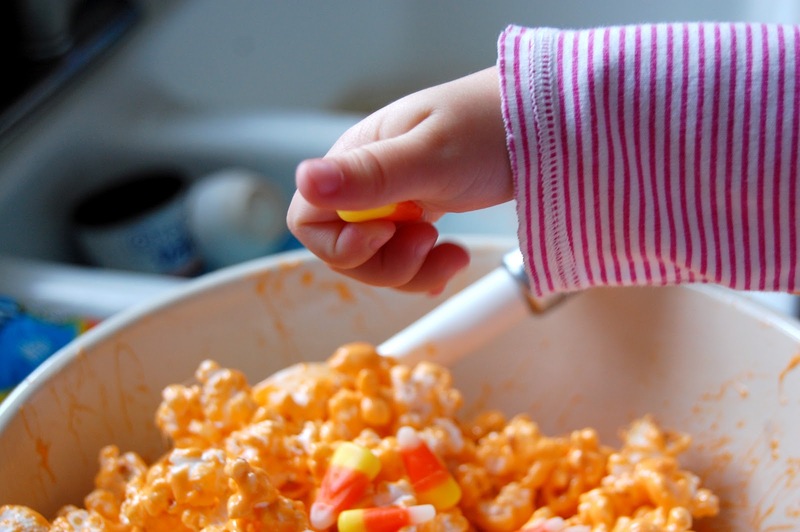 Measure your marshmallows and butter in a microwave safe bowl. Heat in microwave until butter and marshmallows are completely melted. You can do this on the stovetop if you prefer. Stir in your food coloring and vanilla. 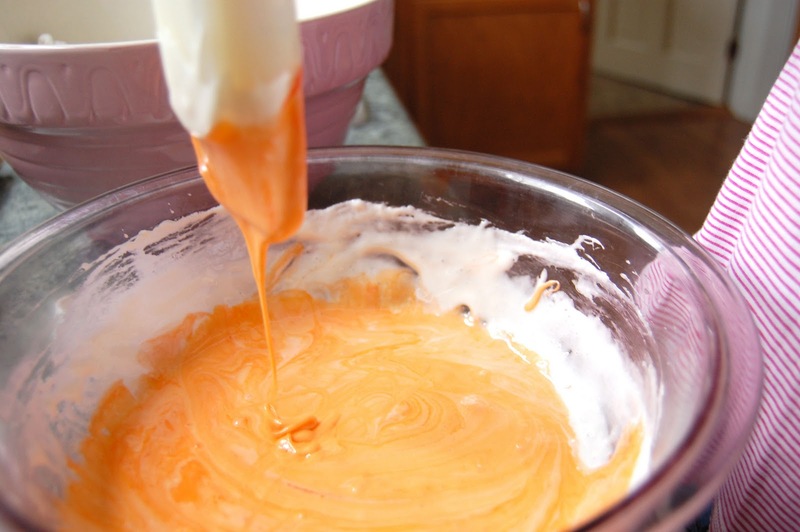 Add this marshmallow mixture to you popcorn and mix. I didn't give you measurements on the add-ins because that's really just to your taste. But I used a couple hand fulls of each. Mix till everything is evenly distributed. Butter your hands (girlie loved this part), and shape the popcorn into balls. Place on a sprayed piece of parchment to set. Today is the last day to enter our drawing for the amazingly cute felt food. ENTER HERE! We will be drawing a winner tonight! Yay! At first I thought that was your hand holding the M&M's and they looked GIANT! But then I figured it out. Ha! Those look tasty. Oh wow!.. 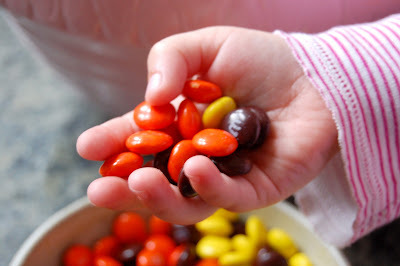 how I WISH I was a little one again.. these look yummy.. and the model is so precious!.. Thank you for this yummy recipe.. always surprising us with yummy things.. thanks!!! love you lots!! YUMMY!! My boys will love this!